While the terms ‘LoRa’ and ‘LoRaWAN’ are often used synonymously, the two refer to different things. The latter is the LPWAN protocol standard that stays in operation in a LoRa technology environment. Taken by itself, LoRa is a type of modulation for IoT communications. NB-IOT, on the other hand, was standardized in mid-2016 by 3GPP (Third Generation Partnership Project). It is a ‘clean sheet initiative’ for devices with low data rates. NB-IOT can be implemented in a standalone or in an ‘in-band spectrum’ manner. There are two major variants of this specification – one released by Nokia, Ericsson & Intel, and the other by Vodafone & Huawei. In a nutshell, NB-IOT is a cellular standard, while LoRa is not. NB-IOT typically works on a slightly higher bandwidth than LoRaWAN. The signal bandwidth requirement for the 3GPP technology is 180 KHz – a couple of levels higher than the 125 KHz support offered by Semtech’s LoRa technology. Interestingly, the signal bandwidth of both NB-IOT and LoRa are significantly higher than that of Sigfox (another popular LPWAN standard) – which operates at 0.1 KHz. LoRa needs dedicated gateways for functioning, while NB-IOT eliminates the need for the same. According to a senior official from Huawei, the NB-IOT infrastructure is set up by connecting the base stations with the sensors directly (the same thing is done in the LoRa architecture through gateways). While the LoRa gateways currently available are powerful and, more often than not, competitively priced, they are additional pieces of hardware that have to be managed – and hence, can be a potentially extra hassle. In NB-IOT, these are simply not required. Note: In an earlier post, we mentioned some high-end LoRa gateways and concentrators. You can check it out here. The LoRa IoT technology works on an unlicensed spectrum (Sigfox does the same). Applications powered by LoRaWAN, hence, have minimal costs – while battery performance receives a boost (more on this later). Unlike the asynchronous protocol of LoRa, NB-IOT services are synchronized and they are provided over licensed frequency bands (both LoRa and NB-IOT use frequency bands lower than 1GHz). Now, the costs for frequency band licensing is not insignificant – with the per-MHz cost being >$500. Telecom operators have the option of deploying NB-IOT in guard bands, in 4G LTE spectrums, and of course, in a standalone network. The LoRa ecosystem is way stronger than that of NB-IOT and the other cellular IoT communication standards. The former has already been adopted as the IoT network standard in many countries, including the United States, Australia, New Zealand, Taiwan and the Netherlands (LoRa is buzzing in India too). In comparison, NB-IOT is a ‘new player’, having made its commercial debut in early-2017 in Spain (Ireland is also set to have its NB-IOT network). The low-cost, high-range, multi-functional LoRa technology has the edge when it comes to a settled ecosystem and community support – but over the next few years, NB-IOT will have plenty of opportunities to catch up. Although the LoRa vs NB-IOT debate has generated a lot of hype, it is interesting to note that the two technologies are optimized for different types of final applications. For instance, LoRaWAN is deemed ideal for apps/devices that have non-frequent communication requirements (say, a couple of times in a day), and have to deliver top-notch battery lives at very low costs. In comparison, the NB-IOT specification works best for applications that need to have minimal latency and are required to communicate more frequently. Both the IoT protocols have their very own unique value propositions – and each has use cases which cannot be served by the other. Leading telecom operators, from different parts of the world, are the main customers for IoT/M2M communication standards like LoRa, NB-IOT and Sigfox (SK Telecom deployed LoRAWAN for establishing IoT network in South Korea last year). However, the LoRa technology can be used by non-telecom operators as well – something that NB-IOT cannot boast of. Networking initiatives that are crowd-sourced can easily access and implement LoRa based IoT solutions (The Things Network already does this). The usability of NB-IOT is still somewhat limited. Long-distance coverage is a shared USP of both NB-IOT and LoRa – and the former is apparently more powerful in this context. Its coverage can extend to 18-21 kilometers – higher than the 12-15 kilometers coverage delivered by LoRa. However, a closer look at this brings to light an interesting fact: NB-IOT works best in sophisticated urban locations, and its performance is not up to the mark in suburban or rural areas (practically any place that does not have strong, glitch-free 4G coverage). Since LoRaWAN does not rely on cellular data or wifi for functioning, its coverage remains relatively steady across all types of locations. Note: The LoRa base stations can be built at a fraction of the cost associated with the 4G-LTE base stations necessary for the deployment of NB-IOT. The lower investments required for LoRa works in its favour in a big way. This one also goes in favour of LoRaWAN. Since NB-IOT works on a cellular, licensed spectrum, the devices have to be synced with the network at regular (and relatively frequent) intervals. This, in turn, eats up some battery juice. No such network synchronization is required in the ALOHA-based LoRa architecture. In the asynchronous bands used for LoRa, the precise nature of the end-application determines how long a device can ‘sleep’ – and hence, battery can be easily conserved. The linear transmitters in NB-IOT, with higher ‘peak current orders’, also put additional pressure on batteries, unlike LoRa (which has non-linear modulations). NB-IOT more or less blows LoRa out of the park in this regard. The average data rate in a narrow band setup is 200 Kbps, about 20X of the data rates at which LoRa tools operate. The higher data rates of NB-IOT make them ideal for implementation in applications that require quicker data throughputs. The LoRa technology does what it is meant to do well enough – but NB-IOT is easily the more efficient IoT protocol for ‘faster’ applications. Note: Sigfox, the other LPWAN technology, offers a data rate of 100 bps – much lower than both NB-IOT and LoRa. The LoRaWAN technology market is in its early stage of maturity, and has found widespread acceptance in public networks. It has already been deployed for the creation of ‘smart cities’ – at various places across the globe. While NB-IOT also works like a charm in the public domain, it cannot be used by private enterprises in their proprietary networks – like LoRa can be. Large businesses can easily create hybrid IoT models with LoRa to create ‘smart facilities’, and simultaneously use the public network for off-facility information and activities. NB-IOT can be used in public models only. LPWAN protocols can be as powerful as they want – but unless they are low-cost as well, they cannot be viable IoT solutions. LoRa holds the aces regarding this. The overall cost of LoRaWAN modules hovers around $8-10 – about half the price of cellular LTE modules like NB-IOT. The greater complexity of the NB-IOT network, the IP-royalty related issues (since it works on licensed bands), and the higher silicon area required combine to push up the total NB-IOT costs. What’s more – upgrading to advanced 4G/LTE base stations (in NB-IOT) is a much more expensive affair than deployments through industrial gateways or tower-top gateways (LoRa). As more integrations happen and markets get more mature, the costs of LoRa technology are expected to go down further. 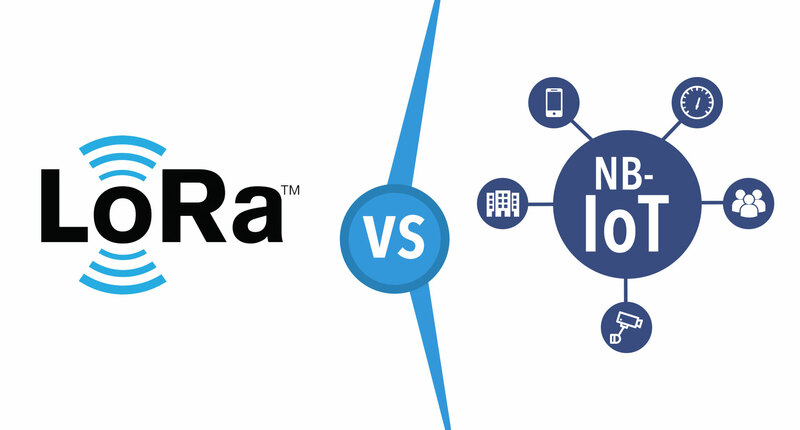 As is evident from our analysis, it is difficult to pick a clear winner in the LoRa vs NB-IOT tussle. Both have their individual high points and shortcomings – and thanks to their technological differences and capabilities, they can easily co-exist – catering to different segments of the global IoT markets. Scalability remains a challenge for both technologies, and it will be interesting to note whether any of the two does manage to become the undisputed leader of the LPWAN market over the long-run.